There were two RN ships named HMS Hibernia built in Devonport, the first in 1804, the second launched 1905. A 110-gun, full-rigged, first-rate Royal Navy ship of the line, launched Plymouth Dock (Devonport) on 17 November 1804: the first HMs Hibernia was designed by Sir John Henslow. Hibernia was flagship of the Channel Fleet in 1805, flagship of the British Mediterranean Fleet between 1816-1855, and lastly flagship of RN Malta until 1902. 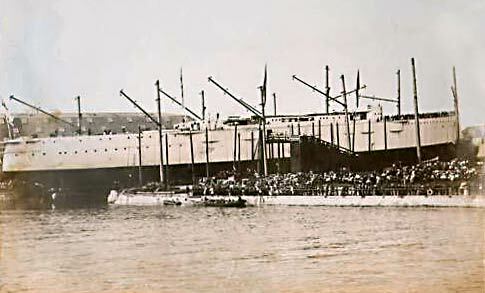 She was broken up in Malta in 1903. The timber that was rescued and reused from the hulk was apparently used in many bakeries throughout Malta, which led to an outbreak of lead poisoning. Her figurehead is believed to be in the Maritime Museum, Vittoriosa, Malta. 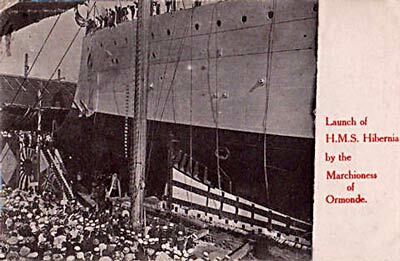 Above and below are two postcards showing the launch of HMS Hibernia 17 June 1905 at Devonport; she was christened by the Marchioness of Ormonde. 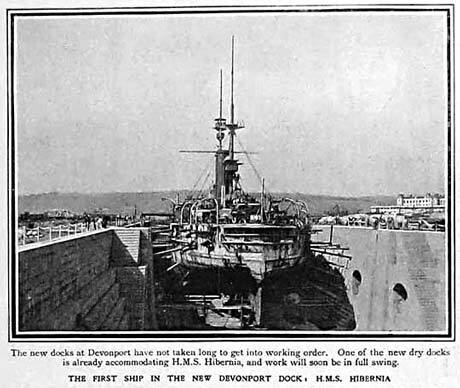 In August 1906 HMS Hibernia docked in the dry dock of the recently completed North Yard extension at Devonport; she was the first ship to use the new dock, see next picture. 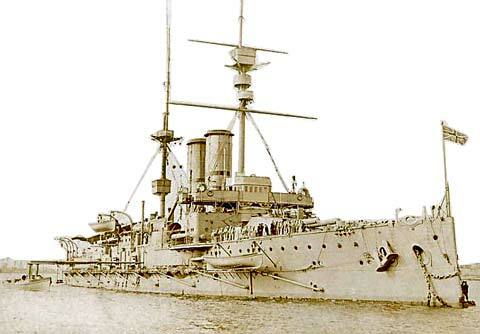 This ship was outclassed and made obsolete from the moment she joined the fleet, in 1907, since one of the new generation of dreadnought battleships, HMS Dreadnought, had already been built and was in service by the end of 1906. 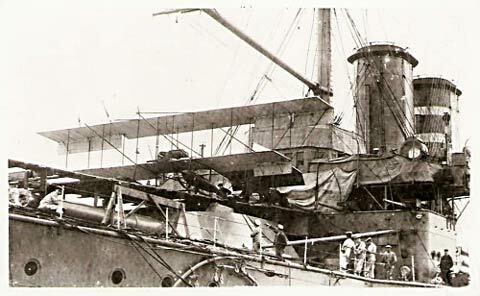 Hibernia was the first British ship from which a seaplane took flight whilst she was underway, after a temporary runway was fitted - see postcard image below. Sources vary on the exact day but the month was May 1912. The flight took place at the Royal Fleet Review in Weymouth Bay, England. HMS Hibernia spent WWI as Flagship of Admiral Freemantle and acted as reserve battleship at Cape Kephalo, the base for the fleet operating against the Dardanell's. She was decommissioned in 1919, sold for scrap in November 1921, then sold on again and eventually ended up in German scrapyards in 1922. Wikipedia provides fuller information on her armament, technical capabilites and operational history.